This week the pose is Salamba Sarvangasana (Shoulderstand). PART 2: There’s more to be said…. As we saw from last week’s blog it has a multitude of benefits, as it’s an inversion. But these benefits can only be gained through staying in the pose. So, one of the significant aspects of Shoulderstand is the requirement to stay and maintain the pose (the asana). In Light on Yoga, BKS Iyengar states: “Remain in this pose for not less than 5 minutes. Gradually increase the time to 15 minutes..” (p.170). In Iyengar Yoga, there are only a handful of other asanas that an emphasis on prolonged duration of holding is given. Headstand (Salamba Sirsasana) is another and they are said to complement each other as Shoulderstand is the mother and Headstand is the father of the asanas. Also regarded as the queen and the king of poses respectively. 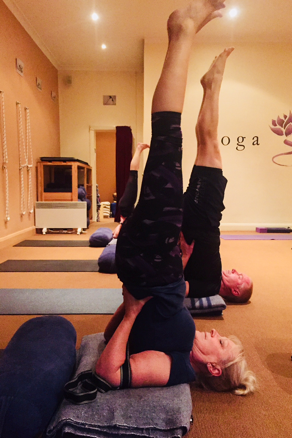 Sirsasana (headstand) is taught at Yoga Path after you can hold Sarvangasana (Shoulderstand) steady for 5 minutes or longer. “In motion, the outer mind is active, whereas if one holds the asanas for a longer period of time, the outer mind is automatically made to move to touch the inner mind and through that inner mind, one is made to reach the consciousness to develop patience and forbearance. It also helps to judge each asana judiciously to get the right position of the asana and to experience firmness and quietness. 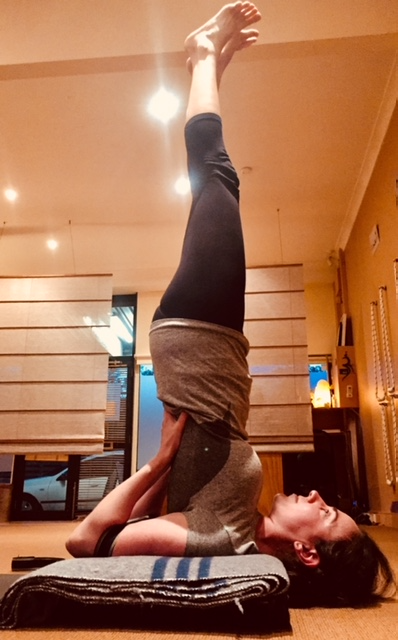 Secondly, holding the asana for a long time helps the mind and intelligence to penetrate the unknown or the unrecognisable parts of the interior body. Penetration involves active attention with action, dynamic awareness and fine adjustments for precise position. Learn more about asanas, inversions and relaxation on Sunday 4th November. Less than 2 weeks to go! Enjoy chai, snacks and brunch in the company of other yoginis at Yoga Path.